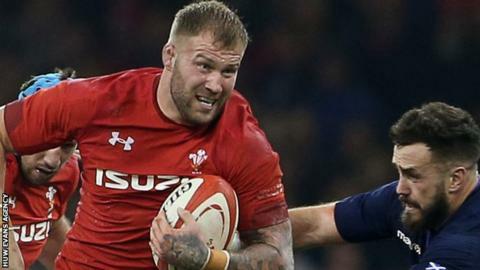 Leigh Halfpenny and Ross Moriarty, who are both currently sidelined with concussion, are included in Wales' 39-man squad for the Six Nations. Scarlets' Halfpenny has not played since November with Dragons' Moriarty sidelined since 15 December. Alun Wyn Jones remains captain in coach Warren Gatland's final Six Nations squad, the only survivor of the New Zealander's first in 2008. The France v Wales game opens the tournament in Paris on Friday, 1 February. Gatland said Moriarty and Halfpenny will be assessed when the squad gathers. "It's important that we don't rush him (Moriarty) back and hopefully he starts training and potentially he will have a game before the Six Nations," he said. "We'll see where he (Halfpenny) is at. He's been advised to continue training and ... if he's right, he'll be in contention but if not we'll have to make some other plans. Halfpenny was hurt in a collision with Samu Kerevi in Wales' 9-6 win against Australia on 10 November, and has twice had to call off returns for the Scarlets because of headaches. Moriarty was seeing a specialist on 15 January, and could yet play for his region before the Six Nation kicks off. Dan Biggar is one of four fly-halves named in the squad after limping out of Northampton's European Challenge Cup defeat against Clermont Auvergne. "Dan has a medial injury but he's a fast healer and hopefully he might be in contention for this game," said Gatland. He also hopes forwards Adam Beard, Nicky Smith and Leon Brown will prove their fitness before the trip to Paris. Like Moriarty, Brown could also be available for the Dragons' game against Munster on 26 January after recovering from a thumb injury suffered on 1 December against Leinster.